Its basically made from 2×4 and 1×4 lumber I cut off the rounded edges of the lumber and reduced it to 1.5” x 3” the unit measures 29” wide by 32’ high. I would like to eventually stain it to match the bedroom set which is mahogany but in this weather it wouldn’t dry in my basement. Here is an aerial view, you can see the solid oak corners. I love working with projects that have different woods in it. 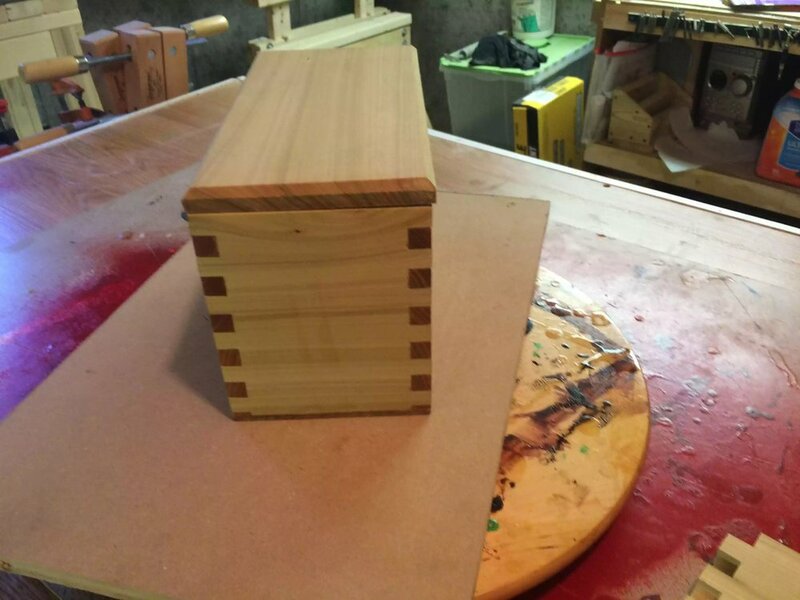 I have meaning to make both sons some keepsake boxes and I was a little tired from doing big projects I thought it would be a nice and small project to do. Step2. fix the front and back pieces ( 1×6x8”) to the sides creating a frame. I placed hole plugs to each hole there was a hole at. Step 3.Create the base (1×10x 12”) router the base on each side accept the back with a round over bit. Step 4.Place the box assembly onto the base leaving a 1/2” space around the box and edges of the base, I traced a line around the outside and inside perimeters of the box so as that I knew where drill by holes to secure the box to the vase, I countersunked the holes and after placing the screws I placed more hole plugs with glue and sanded flush. Step 5.Create the lid making all sides flush with the box and again I routered all edges accept the back with my round over bit I drilled pilot holes for the hasp and hinges ( these hinges are great they stop the lid from folding all the back, I like the bright brass finish off them. Step 6.Finishing I used 2 different finishes polyurethane on one box and beeswax on the other ..
Looks awesome, the beauty of making furniture for your house is that you can customize the size so as that its not too big, or too small. I wasn't yet experienced in other joinery methods as I made this in 2015. My son had asked me to make him a desk and since his room is not the biggest I decided to custom make his desk to the room and his dimensions. The back is also 1×12 with a series of pockets to adjoin the pine to the 2×4’s and the pine board on the right.. I finished the whole unit with stain and 3 coats of poly. My son needed a bedside unit so as that he could put his alarm and growing companies lectionaries of bedside reading. It’s basically a plywood box with dado and rabbit joints as joinery I also used screws and glue to assemble the unit. I plugged the screw holes with dowels and sanded the plugs flush. To hide all the plywood edges I decided to put a solid wood edge banding around the plywood top and also made a face frame so as to conceal all the plywood edges on the outside of the unit. The back hardboard panel is recessed in a rabbited back and Brad nail it in place . The drawer is very basic I used plywood for its construction and used my pocket hole jig to assemble it. In hindsight I should of added legs or feet to the base, as its gathering dust. I can always add that soon. Sometimes I revisit projects that I have made and thing to myself is there anything I can add or something I would do different if I were to make it again, well this project needs feet. I didn’t like all the sharp corners on the top edge banding so I used a 3/8” round over bit in my router. I used a jig on my router table to make the finger joints. Contrasting Woods inprojects like these is awesome. Here you can see the box insides. Anyway the dimensions are 10” wide, 5.5” high and 5” deep….. I used a antique pine color and it looks great, really brightens up his room. I used pocket hole screws. 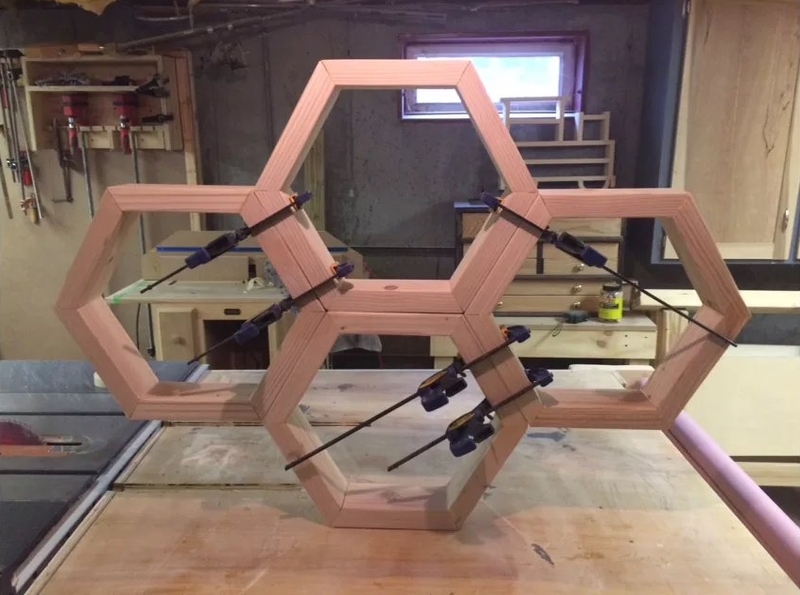 I saw a project online similar to this one and I had just bought my Kreg K4 jig and thought to myself this is a perfect project to start using the jig. My unit was made out of 1×12 pine board and I needed (2) 8’ lengths to get a unit that has 5 shelves in it..I attached some Sketchup drawing below to give you an idea of dimensions, but the beauty of this project is you can add or remove the number of shelves to suit the space it’s going into. Qty (10 @ 11.25” sq) ( 1) at 6” high and 11.25” wide as the footer piece. Step 2: Kreg Jig.. Place pocket holes in all necessary pieces make sure you know the orientation of the unit so you know where to place the holes in order to conceal them. I used 30 pocket hole screws. step 3: round all corners , I attached a drum sanding bit to my drill press and banged them out in no time ( basically any corner that’s outward facing that doesn’t abut any other piece of wood should be rounded.